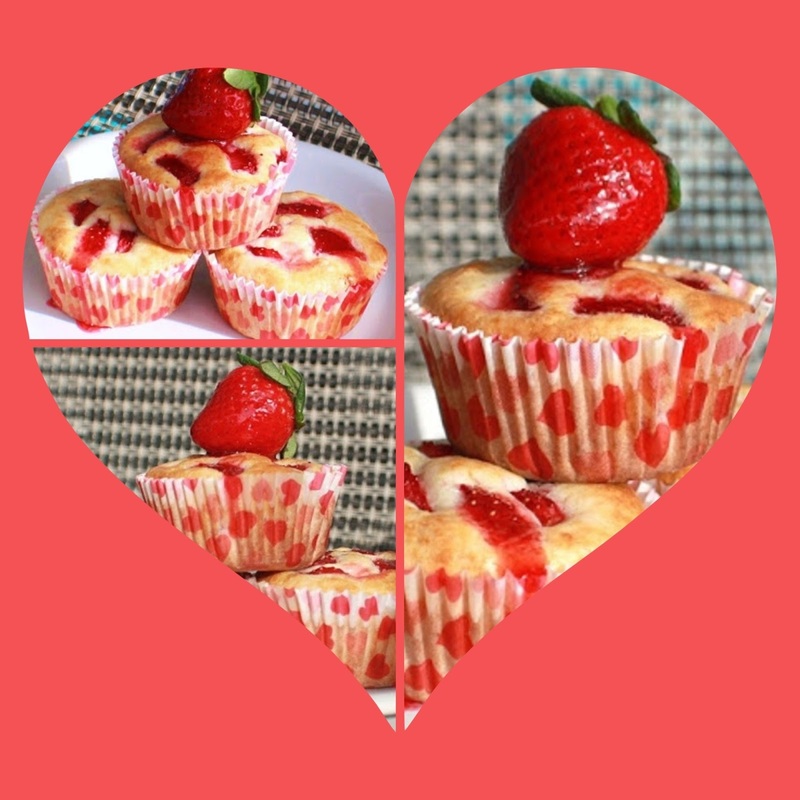 What nicer way to wake up to than a fresh Strawberry cream cheese muffin for Valentine's Day? It's a sweet gesture for sure. If you're not the baker give the recipe to your significant other to make! Every year I try to make something special if my husband isn't working that day. I love making muffins that look festive. These were just a spur of the moment since I had the strawberries and jam. They just seemed to be the perfect combination of flavor for Valentine's Day. We enjoyed them with some hot coffee and sat feeling grateful to be with each other for 12 years already. Every year gets better. The years go by so fast and I never take any days for granted. The little things matter and for me I can show someone in the family how much I care just through the foods I make. This is just an easy way to say Happy Valentine's Day to someone you care about whether it's a significant other or just because you love them. Preheat over to 350F. Line muffin pans. Using a small bowl, make the above cream cheese mixture blending with an electric mixer, beat cream cheese, sugar and vanilla until smooth. Set aside. Combine flour, sugar, baking powder and salt in a seperate bowl. Set aside. Whisk together milk, melted butter,extract and egg in another bowl. Fold the milk mixture into the flour mixture gently until all ingredients are moistened. Spoon the batter into the prepared paper lined muffin tins around 1/2 full. Top with chopped strawberries over each one. Top it with a teaspoonful of cheese mixture, a teaspoons more of muffin batter to cover it, and finally a more strawberries. Layering every cupcake muffin the same way. Bake for 25 minutes, until they’re light golden on top and a toothpick inserted in the center comes out clean. Let the muffins cool in the pan for 10 minutes. Serve with heated strawberry preserves. These look fantastic. I love how the strawberry is running down the cupcake wrappers onto the plate. Your picture does reveal that these are packed with some really juicy strawberries-yum. As far as I am concerned the more big chunks you can squeeze in there the better-you definitely did wonderful in that respect. Lovely picture! Happy Monday Claudia! Very strawberry =) yummy and delicious! For whatever reason, some very good strawberries appeared in our grocers last week. I can't think of a better way to use them. Great cakes and strawberry goes so well on valentines. Simply mouthwatering. Ciao! They look like great muffins, Claudia and I love those little liners! I love strawberries, cream cheese and muffins so I know these have to be sensational. Plus they look beautiful. Thanks for sharing this recipe that I'll be sure to try. Oooh, these look delicious, pretty and BRIGHT! Happy Valentines Day! These muffins sound amazing! Strawberries & cream cheese is something I could definitely see myself devouring. And what cute liners! Hope you had a great V-Day! Wow these look really beautiful and delicious!Strawberry is my favorite fruit! Will def try this recipe. You have very cute blog! Thanks for sharing ! 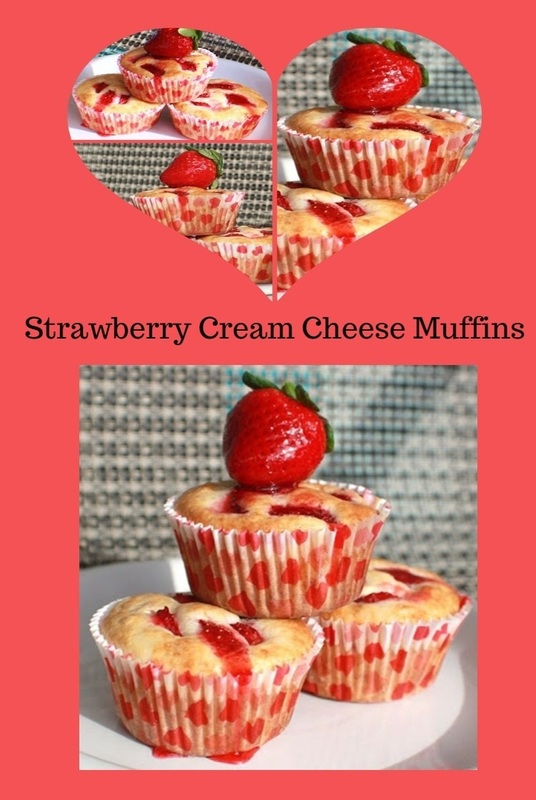 Mmmm, cream cheese muffins sound divine, especially with strawberries! :) Well done! What a delicious surprise in the middle! I need to make these for my knitting group!